A few weeks ago I came across this 31 day challenge and as I was thinking more and more about participating in it, I tossed around several ideas of what I wanted to write about. It all came down to what I’m going through right now in one aspect of my life at the moment. Then I saw a quote the other day that said “Family is a homes heart”. That really spoke to me because I realized that not only is it the physical house that is driving me crazy and the lack of organization, but it’s the chaos in my family that is driving me crazy and the heart of our home is not beating the way it should. It is probably beating so badly we should be seeking emergency care! I decided then that I would focus the next 31 days and then some on restoring the heart in my home and working on my family. 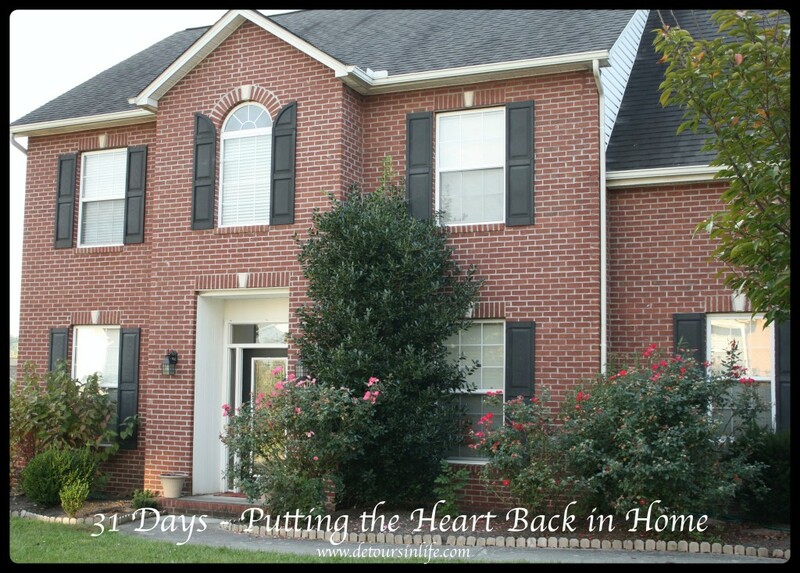 I hope you will join me the next 31 days as I go through the good, bad, and the ugly in trying to get organization back to the house which will help the family run smoother and also work on ending the chaotic environment that we tend to live in that drives all of us crazy. Bookmark this page as this will be the jumping off point or index page for the entire month starting on October 1. I will try to keep the post brief and to the point so as to not overwhelm you, however, I do tend to get long winded sometimes – just ask my husband! I would really like comments and feedback on my quest so please feel free to leave me comments on each post. I know that I can’t continue living like this and I know my kids can’t either so I hope that we can start down a good path. I also hope that there are others out there that are going through the same thing in their house and want to work along with me to make things better and put the heart back in home. Day 2 – How did I get here? Day 24 – Time Change Yet?